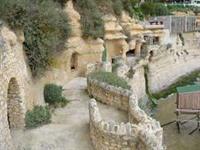 Citadel and thirteenth century town, Talmont is part of the Association of the most beautiful villages of France. This listed site is remarkable both by its environment of water and swamp and by the traces of its millenary history. Starting from the gate of the city, you will go up to the promontory where begins the walk of the ramparts dominating the Gironde and leading to the church of the XIIth century, Sainte Radegonde, jewel of the Romanesque Art saintongeais. The marine cemetery which borders it, flourished with hollyhocks in summer, is marked by a wild and beautiful poetry. Its Museum of local history and fishing in the estuary completes the visit. From the tip of the Caillaud rock above the waves, the Talmondais vineyard now offers a unique, award-winning wine. To know everything about the history of the vineyard to the wine, from antiquity to the present, come to test and deepen your knowledge in the heart of the vineyard. From Prehistory to History, 2 kms from the village, the archaeological site of Barzan, at the place called "Le Fâ", is one of the most important in the Poitou-Charentes region. At 4 kms, discover and follow the footsteps of our most famous troglodytes the Grottes de Régulus in Meschers-sur-Gironde. At Saint-Georges de Didonne, in a unique setting perched on a cliff and in the heart of a wooded area, the Parc de l'Estuaire will reveal the secrets of Europe's largest estuary, a world of sensations. They await you in Pays Royannais, beaches of fine sand that rhythm the 70 kms of shore. A Wild Coast to tame, from St-Palais-sur-Mer to Meschers-sur-Gironde, with its rounded conches and small coves that extend along this rocky coast.